“This is another milestone in the long and mutually beneficial relationship CPA Australia has shared with the Sunway Education Group and its many subsidiaries. As a prestigious institution, Sunway TES Centre for Accountancy Excellence plays a vital role in the growth and progress of the accounting profession in Malaysia,” said Wong Chin Aik, President of CPA Australia Malaysia Division. “Taking up the CPA Program provides that first step in gaining invaluable all round knowledge from a base of global business, strategy and leadership. The commitment to begin the professional qualification journey early by the undergraduate can only be perceived as a positive intent by employers,” said Wong. The CPA Program is a world class, international recognised program. The content of the CPA Program focuses on strategy, leadership and international business and is designed to give candidates the skills to stand out in the real world. CPA Australia uses examples drawn from current news and legislation so each subject is interesting, and highly relevant and applicable in today’s global marketplace. Comprising of 6 subjects, the CPA Program is positioned within a broader context of contemporary business including corporate governance, ethics and integrity, development and implementation of business strategies, decision-making and leadership. Integrated into the CPA Program, the practical experience requirement requires the candidate to complete at least 3 years of supervised, relevant work experience in accounting and finance. The launch also saw pledges of support from nine organisations including Baker Tilly, BDO Malaysia, Deloitte, EY, Grant Thornton, IBM, KPMG, PwC and Sunway Berhad. “The funding from TalentCorp together with the pledges will definitely lighten the burden of many aspiring accountants whilst ensuring that we can with your support, nurture well-rounded professional accountants. I am positive that we will be able to meet the growing demand as we are currently at only the halfway mark to reaching the targeted number of 60,000 professional accountants by the year 2020,” said Dr Elizabeth Lee, Senior Executive Director of the Sunway Education Group and Sunway University. Johan Mahmood Merican, CEO of TalentCorp Malaysia advised the students in attendance to take up the opportunity to be equipped to get a high income career path, and to reap the potential opportunities and benefits arising from the high economic transformation. 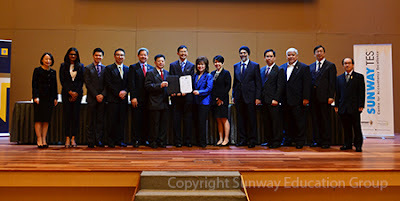 He also mentioned that to make such a collaboration such as the CPA Program work, involves the close collaboration and of many parties especially 5 key stakeholders; mainly the professional working bodies, the tuition providers such as Sunway TES CAE, universities, the stakeholders who are the employers and the talents, the students themselves. It was also announced today that CPA Australia will be offering scholarships to 5 (five) High Distinction UQF candidates for 3 years. The scholarship will include support for 1 CPA Australia segment, 1 year ASA membership fee waiver and 1 Membership Entry Pathway Assessment (MEPA) waiver. Wow, just amazing test prep tips. I am surely going to follow these. I will take LSAT in this summer and I personally like self-paced study as I think that one can learn perfectly with individualized study. But recently I have subscribed to one of the LSAT Prep courses so that can get help at some difficult parts such as logic games.